Gentoo Forums :: View topic - plasma: "you are not authorized to mount this device"
plasma: "you are not authorized to mount this device"
Every time I attach a usb stick or other flash device to my computer, and try to mount it from the device notifier in KDE Plasma 5, I get this notification, "you are not authorized to mount this device". This is on all three computers I have, 2 running mostly stable and one running unstable. Interestingly enough all three computers worked just fine under KDE4. I've been beating my head against the wall on this since plasma came out. I always ended up mounting from the command line. I had the same issue too. It's actually strange clicking on an eject icon to mount an external USB storage. And the arrow changes from down to up also! Now when I insert a usb stick I can select "Open with File Manager" and dolphin opens. Thanks for this thread. This has been driving me bonkers for a long time. This solved my problem too. I don't much care for the new design, but, to be fair, it's not an eject icon. The down-pointing arrow is the media-mount symbol. The upward-pointing arrow is the media-eject symbol. Therefore you click on the down-pointing arrow to mount the external USB device, and you click on the upward-pointing arrow to unmount the external USB device. 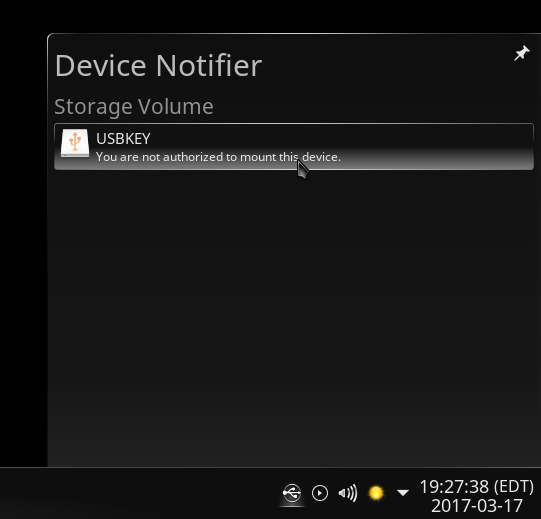 One advantage of the Plasma 5 Device Notifier design over the old KDE 4 design -- at least how it was in my KDE 4 installation -- is that you can mount, unmount and mount again the USB device without having to unplug it. In my old KDE 4 installation, once I had clicked in Device Notifier to unmount a USB device, I had to unplug it and plug it in again in order for KDE 4 to be able to re-mount it. I really dont see the arrow that you are all talking about. I'm trying the polkit change to see if it solves my issue, kinda annoying to go in shell as root to manually mount a usb stick! If you move the pointer to the right of the bar a button appears. Try this and tell me. Well, that does not *really* answer my question, I have them also installed but what matters is your selection in systemsettings. If I take it as your answer though, that would point to a missing icon in the alternative oxygen icon set. I set Oxygen as Icon theme of course. I don't care so much about that particular icon. Right, found it!! Thanks, and yes it does mount it! Although there is no icons to "mount", the eject is showing up for the umount. I'll eix-sync and reinstall the package just in case! Rebuilding it was not asked for, if you read carefully. oups right. Therefore I guess there is nothing I can do about the missing icon; unless perhaps opening a bug. The simple fix to rules listed above worked perfectly. The real fix here rather than working around consolekit's quirks will be switching to elogind, which will happen asap. Which will then automount the usb key, but have a bug when user remove the key? I'm not aware of such a bug with elogind, no.